what makes binoculars work is actually the optical systems that are used inside them. Therefore, Understanding binocular optics is important in knowing how these devices are made. 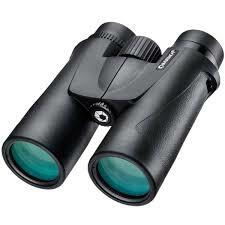 Binoculars have three main optical systems which include; the objective lens, the eyepiece lens, and the prism. The objective lens function is to gather light from the object and form an image at the image plane. The eyepiece lens then takes the image at the image plane produced by the objective lens and examines it before rendering and making it visible to the viewer’s eyes. The prism which is a large piece of glass is used to correct the image orientation. This is because the lenses produced the image that appears upside down or laterally inverted. Binoculars are often classified by the type of prism used to assemble them and there are two popular types of prisms used in binoculars today. 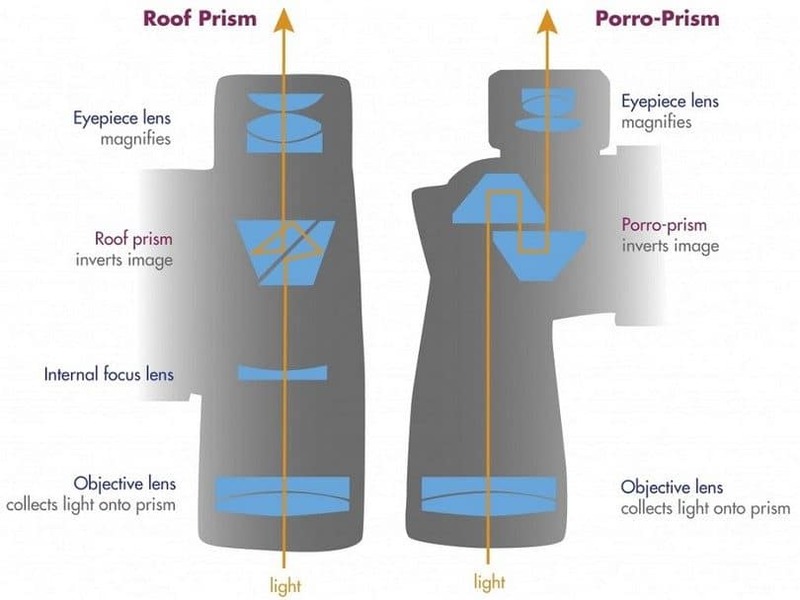 namely; roof prism and Porro prism. The binocular objective lens is the further lens from the eye when viewing also known as the field lens. Also, the objective lens consists of two or more lens elements in an achromatic or apochromatic configuration. The most common lens in standard binoculars is the achromatic doublet. while high-quality binoculars especially the large types used for astronomical purposes may sometimes even have an apochromatic triplet. 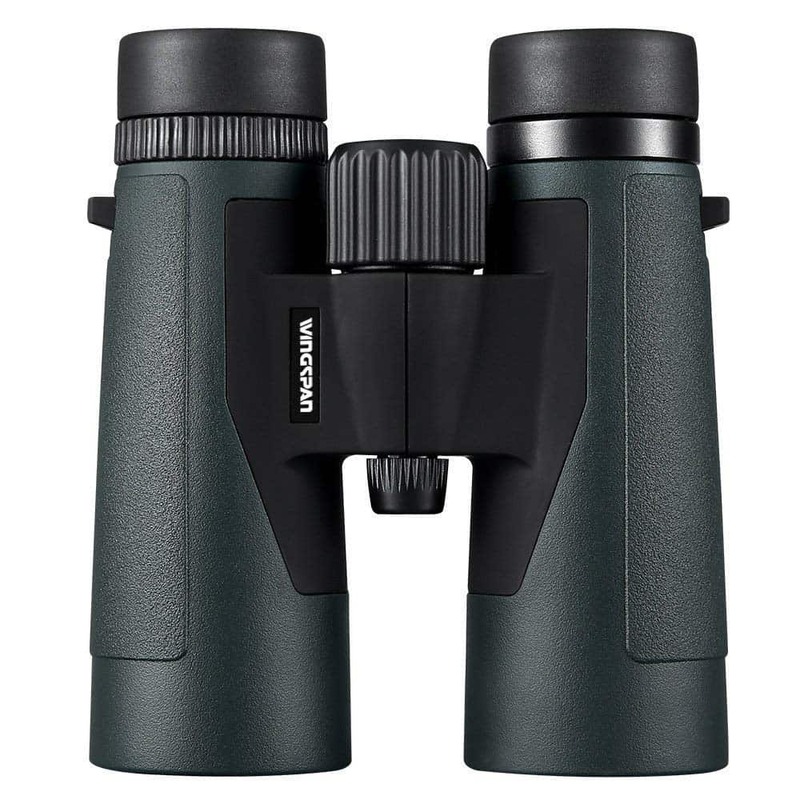 Depending on the quality of the binoculars, there may also be additional lenses to correct other optical aberrations such as spherical aberration, field curvature or coma. Modern achromats configuration usual use special glasses such as extra-low dispersion(ED) glass, in order to give better color correction. These days, you would find high-quality binoculars using this kind of achromatic configuration in the market. Achromats basically bring two colors of light to the same focus. A basic and simple achromatic doublet would have a biconvex element of crown glass in front of a weaker diverging element of flint glass. Apochromats, which bring three wavelengths of light to the same focus, may employ expensive (but brittle) fluorite glass. Every binoculars use an objective lens and usually have the numbers printed on them. As I recently explained in my recent article about understanding binoculars power, when you see numbers like these (e.g. 7x35, 8x50). This is the binoculars power of which the first number 7x represents the magnification of the binoculars and the second number 35 in millimeters, stands for the objective lens diameter size. The objective lens size determines how much lights the binoculars can gather from the object in order to create an image of it for the image plane. These days, the objective lenses are being coated with chemicals to reduce reflections in order to produce better images. The coating layers can vary from partial to fully multi-coating layers. The more coating layers the lens has, the more powerful they become. The other thing worth mentioning is that bigger objective lens size means more light gathering capacity of the binoculars but, it comes at the expense of weight and portability. The lens size determines how heavy the binoculars will be. The eyepiece lens is the closest lens to your eye with the objective lens been the further from the eye. Binocular eyepiece lens usual consist of three or more lenses in two or more groups. The most common eyepiece lens grouping is the venerable Kellner configuration. This design is one of the oldest configurations dating back to the 1840s which consisted of a single filed lens and a doublet eyepiece lens. In 1975, another increasingly common design was introduced called the reversed Kellners configuration by David Rank. In this design, the field lens is doubled and the eyepiece lens is single. The later configuration was found to be more advantageous than the first design. In the sense that it offered a slightly wider field of view((50° as opposed to the 45° of a Kellner), over 50% more eye relief and working better with short focal ratios. The prisms in binoculars serve a primary purpose, which is to correct the inverted and laterally inverted image that is created by the objective lens and the focused by the eyepiece lens. Their secondary purpose is to fold the light path so that the binocular will be shorter than they would otherwise be. This has helped in making binoculars smaller and easier enough for people to handle with their hands and move around comfortably. 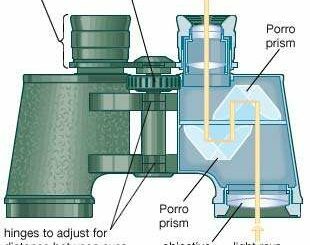 As earlier on mentioned, binoculars are classified according to the prism type used in them.these are the roof prism binoculars and the Porro prism binoculars. Now let’s look at each prism type in details. Roof prism binoculars are easily identified by their straight-through look. They are more stylish, nicer looking and very compact than Porro prism binoculars. The reason is roof prism is made with a combination of semi-pentaprism and a Schmidt roof prism. 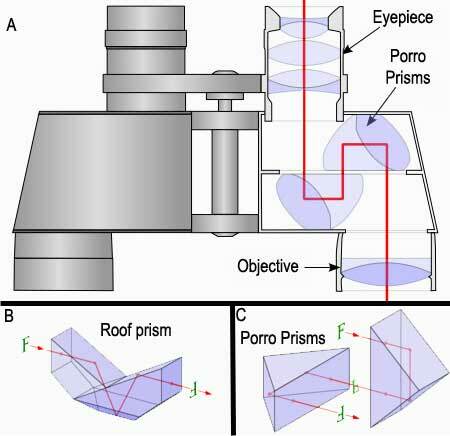 Although roof prism tends to have a physically smaller configuration, hence uses less material for manufacturing, it is often significantly expensive than their Porro prism counterpart with equivalent optical quality. That is because roof prism systems are made to be of high tolerance and more precision than Porro prism systems. Any irregularities or thickness in the ridge of the roof will result in visible flares. Also because of the design of roof prism, there is some reduction in contrast, thus phase coating is usually applied to the faces of the roof. Binoculars with phase coatings usually have “PC” as part of their designation. Even though roof prism binoculars are more expensive than Porro prism binoculars with same specs, they have visible advantages which make them more expensive. Such as they are more compact making them easier to pack and carry and they are slightly lighter than Porro prism types as well and also visibly appealing to the eyes too. Porro prism binoculars have the look of a doglegs shape. The Porro prism system consists of two isosceles right-angled prisms mounted with their hypotenuses facing each other but their long axes exactly perpendicular. It is particularly important that the prisms are exactly right angled otherwise image rotation will occur. when internal reflection happens in Porro prism binoculars, the reduce the contrast of the image produced. This reflection can be eliminated by putting a groove across the center of the hypotenuse. 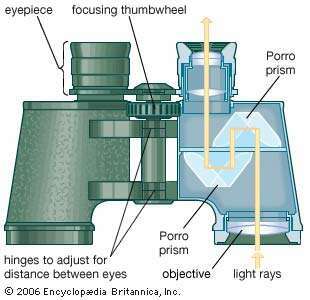 Hence grooved prisms are a feature of better quality Porro prism binoculars. It is important to recognize that the prism glass is but one of the many considerations that affect image quality. 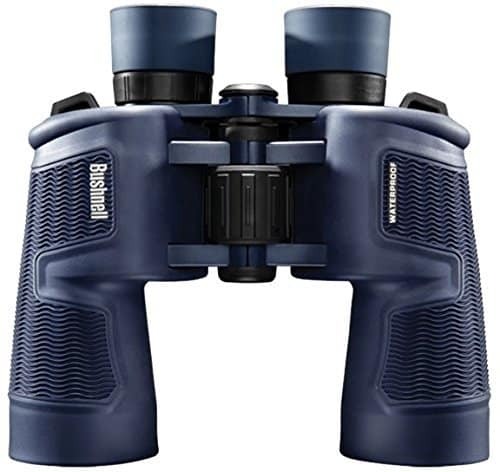 There are excellent older binoculars that use BK7 glass for the prisms and which give a better image quality than many of the modern budget offerings that have “BaK4” printed on their cover plates. Bak4 is a glass designation used by Schott AG, an old and respected German manufacturer of optical glass. Although there are international standards for optical glass designation, BaK4 isn’t one of them. Anyone can apply it to any glass. This is what you should know: the “BaK4” glass used for the prisms of Chinese binoculars is not the same as Schott BaK4. In fact, it’s not even barium crown, which is what BaK stands for! It is a phosphate crown glass with a lower refractive index and dispersion than Schott BaK4 (but higher than BK7). In conclusion, understanding binocular optics is all about the objective lenses, the eyepiece lenses and the prisms(roof and Porro prisms) used in making binoculars. Those are the major binoculars optics. What are Binoculars Made of? 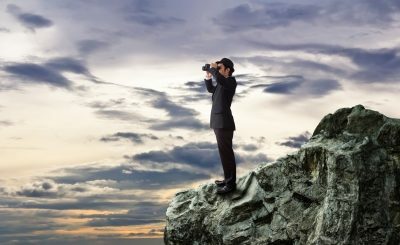 What are Binoculars Used For	?